A small crew from Don Weston Excavating, a Williston company, made a historic find last week in downtown Burlington. While digging at the intersection of Church and Maple streets as part of a citywide water line replacement project, the crew broke through the top of a small, mysterious tunnel that runs east to west, six feet below Maple Street. 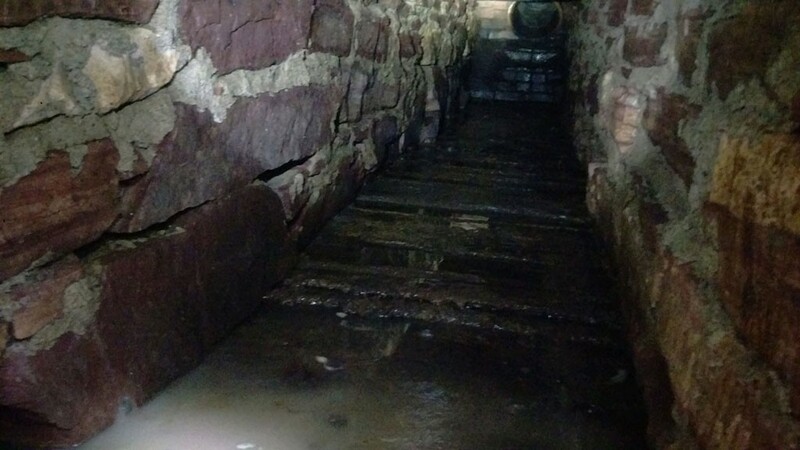 The underground passage is two feet wide and about two and a half feet tall, and had water trickling through it, workers said. It is solidly built, lined with large stones bound by mortar. The Department of Public Works believes it's an old stormwater runoff line that routed water to Lake Champlain in the horse-and-buggy days, not too long after the city was incorporated. A crew found a similar structure a few blocks closer to the lake earlier this year, DPW water resources engineer Martin Lee said. But DPW's databases, maps and written records, which contain decades' worth of information, contain no record of the structure. It could easily be more than 100 years old, Lee said: Water infrastructure in the older parts of Burlington dates back to the 1890s. Though it's not up to modern construction standards, the tunnel inspired respect from people who do this kind of work for a living. "The stonework is pretty cool, and it was very deep," Lee said. "However they built, it would have been pretty impressive." DPW is happy to leave this bit of city history as it was. Lee said his department is loath to disturb it, not knowing where it goes or whether workers would somehow alter the flow of water, doing more harm than good. Last Friday morning, a crew paved over the newly installed water line, once again encasing the long-lost tunnel, which perhaps will be rediscovered in another century or so, when Burlington's pipes again need an upgrade. The original print version of this article was headlined "Tunnel Vision"